Away from the hustle and bustle of the city, the Zilla Parishad High School in Kanukunta village, Jinnaram Mandal in Medak district, Hyderabad is a cheerful place to be. 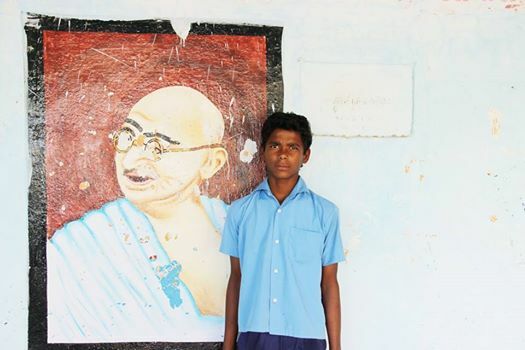 It’s here we meet Kiran, a 15-year-old boy who wants to make a difference in this world. Kiran is a 10th standard Akshaya Patra beneficiary who has a firm determination to join the police force with a moral virtue to serve and protect the public. Kiran is born and brought up in Kanukunta village. His family is into agriculture and owns a small plot. His parents work as farmers to earn their livelihood. He has an older brother who is married and also practices farming. While Kiran projects an energetic boldness, he has a humble personality. “When I join the police force, I wish to serve the public wholeheartedly. I want to fulfil this for my family. I know I have to work hard to achieve this,” says a confident Kiran. Kiran is happy to show his appreciation toward the Akshaya Patra meals, and tells us that he and his friends are fond of the food. “I like the fruits also,” said Kiran (Fruits are provided to various schools in Hyderabad by Akshaya Patra). Kiran is fluent in Telegu. He is quick to tell us that he likes mathematics. He points out that learning his state’s language is important to him to communicate with people, especially if he has to join the police force. Kiran looks forward to joining the police service as soon as he completes his education. “I will do my further studies and then write the IPS exam,” he says. Kiran’s moral disposition boosts his willpower to reach his dreams of become a public servant of the country. We wish him all the best in his future endeavors. 20th December (Saturday): 3.30 p.m.
21st December (Sunday): 5.30 p.m.
Akshaya Patra’s VK Hill kitchen was conferred the highest award of ‘Outstanding Performance in Food Safety’ and the Hubli kitchen received the 2nd highest award of ‘Certificate of Commendation for Significant Achievement in Food Safety’. Tune in to the Zee Business Channel to watch the coverage. Akshaya Patra’s Hubli and Vasanthapura(VK Hill) kitchens have been awarded the coveted CII National Award for Food Safety – 2014! 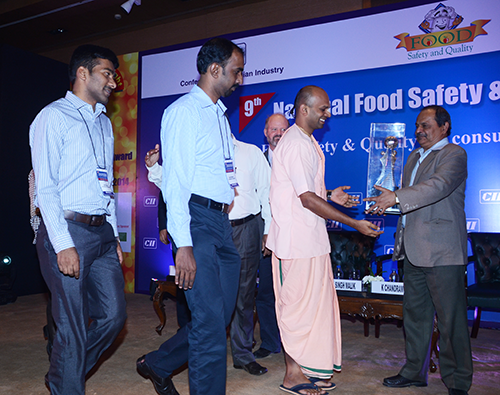 The awards were presented at the 9th Food Safety and Quality Summit held in New Delhi on December 2nd, 2014. The award highlights role models and identifies the ‘Best in Class’ in the manufacturing and food service organisations of India. It provides such organisations a platform for national recognition, and also allows participants to assimilate benchmark practices for future development. Akshaya Patra, Gujarat won the Platinum award in the first category at the 3rd Ann ual Convention and Competition of Lean Six Sigma. The event attended by about 500 people from India and abroad was hosted on 9th October by Concept Business Excellence Pvt. Ltd, Vadodara. About 40 case studies by leading manufacturing companies were put forward in the session on Lean Six Sigma tools, from which Akshaya Patra was the first and only NGO to participate in the session. The Foundation received a standing ovation from the competition’s esteemed judges and audience for their case study. Along with Akshaya Patra, there were two other Platinum award winners in the first category. The other award categories were Diamond and Gold awards. The Chief Guest of the event was Dr. Per Petersson, Senior Partner, Lean management coach and author; Guest of Honour was Dan Blucher, Senior Partner, Lean management coach and author, with Guest Speaker Sandesh Kadam, Site President, Reliance Industries Limited at Silvassa. Receiving the award on behalf of Akshaya Patra were Tushar Dange, Amarnath Sharma, Amrit Sahoo, Puneet Tripathi and Ajay Wagh. The theme for this year’s event was ‘Lean Six Sigma for Global Competitiveness’. Global Competitiveness here refers to India’s best performance across economic, social and environmental conditions. It encourages data driven policy based on evidences, identification of good practices, and improvement in statistical standards, amongst others. In line with this a Lean Six Sigma approach enables organisations to produce a product/service better by eliminating redundancy, decreasing output time, reducing wastage and developing a zero defect product. The project which was implemented in Surat achieved the reduction of cooking gas cost by 10 per cent, and streamlined certain processes like raw material flow to the machine, and optimisation of baking temperature and machine speed. In fact the kitchen team achieved four to five times the goal they had set for the project. This annual convention provided a platform for a wide cross section of industrialists from varying leading companies to discuss real life case studies on how Lean and Six Sigma practices will help streamline and enhance a company’s results. It is an honour for Akshaya Patra to be a part of this programme and receive this illustrious award. Agreed.Childhood is those years of life which are cherished by most of us, but the story is not same in many cases. Akshaya Patra captures an overview on its latest film – ‘The Possibilities.’ This compelling film brings to fore the plight children go through when they are not presented with a childhood they deserve.The film will be released on the eve of Children’s Day – 13th November, 2014. ‘The Possibilities’ portrays various struggles the child protagonist undergoes in order to survive. And how just one wholesome mid-day meal served every day at school can change his life. R. Rahman and Viacom/MTV have kindly offered the famous soundtrack ‘Naan Yen Piranthen’ as background music for the film. The child’s role is performed by Chetan, a Malayalam child artist. The film is expected to reach millions bringing their attention to possibilities in life of a child who is affected by hunger and how mid-day meals can change it. The Akshaya Patra Foundation, an NGO headquartered in Bangalore, implements mid-day meal program in partnership with Government of India and various State Governments. The organisation is commended for its hygienically prepared nutritious food. This world largest (NGO run) mid-day meals program reach 1.4 million children from over 10,000 schools across 10 states in India. Not everything is in our hands to change in a child’s life.